I have been laying in my bed recovering from a back injury that I gave myself falling down the stairs in my home. As a stay at home mom, I would call that a work related injury but it does not work that way! No workman’s comp for me! Well, here I was looking at my iPhone to find signs of life beyond the walls of the bedroom I was recovering in. I found signs of life on facebook and twitter. I have been following other cooks and foodies on twitter and frankly by now I was downright hungry. The craving: brownies! Did I have a simple mix that I could just have my kids whip up? NO, of course not! But that’s okay. Child labor (when brownies are involved) make willing hands to help. I dug out a recipe book that was published by Family Fun Magazine. 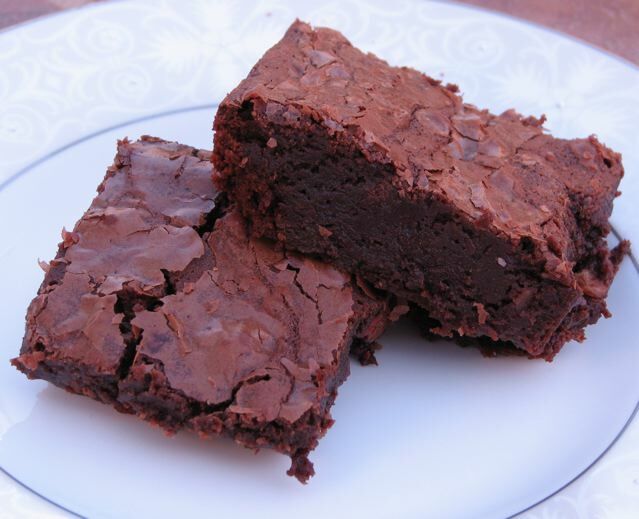 The Family Fun Cookbook and made their Chocolate-Lover’s Brownies (pg 194). In the microwave, melt the butter and chocolate for about 3 minutes or until the mixture is completely melted. I microwave f or one minute, stir and then heat in 30 second increments until it is melted, stirring after each time to combine. Allow to cool for about 10 minutes after it is combined and melted. In a bowl, using a mixer on medium high speed combine the eggs and sugar and beat for 3 minutes until the egg mixture is pretty light in color. After the chocolate mixture has cooled add it to your egg and sugar mixture and combine. Add flour and salt to the mixture and slowly combine. Last minute: throw in your nuts and M&Ms if desired and just stir to combine. Pour into the prepared baking dish and bake for 28-30 minutes. Allow to cool completely (if they make it that long). Can be stored in freezer if desired. Categories: Dessert - Cakes, Family Cooks, Kid's can cook! | Tags: Brownies, dessert, from scratch baking | Permalink. Injured, but I promise to return! Last Wednesday I took a tumble down the bottom 4 stairs landing flat on my back and then sliding down the rest. After x-rays I had no fracture to be found, but it put me out of commission for almost a week. Visits to the chiropractor are already promising. 🙂 I promise my posts will return soon. Taking it easy for a while here though. Thank you for following my blog. Please use the handrail! On the theme of what is in my pantry/fridge/freezer that I can make this weekend? I made Shrimp Scampi. I used Ina Garten’s recipe in her Family Style cookbook. I like eating Angel Hair pasta rather than linguine and made a few changes to accommodate what I did have or did not have. 3 Tbsp minced garlic (9 cloves) I only had the garlic in a jar and used 3 heaping tsp. Bring a large pot of salted water to a boil and add a little vegetable oil. Then add pasta and cook according to package directions. Drain and toss with olive oil so the pasta does not start to stick. While the water is coming to a boil, heat a heavy bottomed skillet (I used my cast iron skillet that is 14 inches), melt the butter and 5 Tbsp of oil over medium-high heat. Add the chopped garlic and cook for about a minute, being careful not to burn it. Add the shrimp and stir and flip them as they cook until they are no longer pink, but do not overcook them or they will become rubbery. Season with salt and pepper. Remove from heat and add parsley, lemon zest and juice, and red pepper flakes. Toss to combine. Serve over pasta with a side salad or fresh green beans. 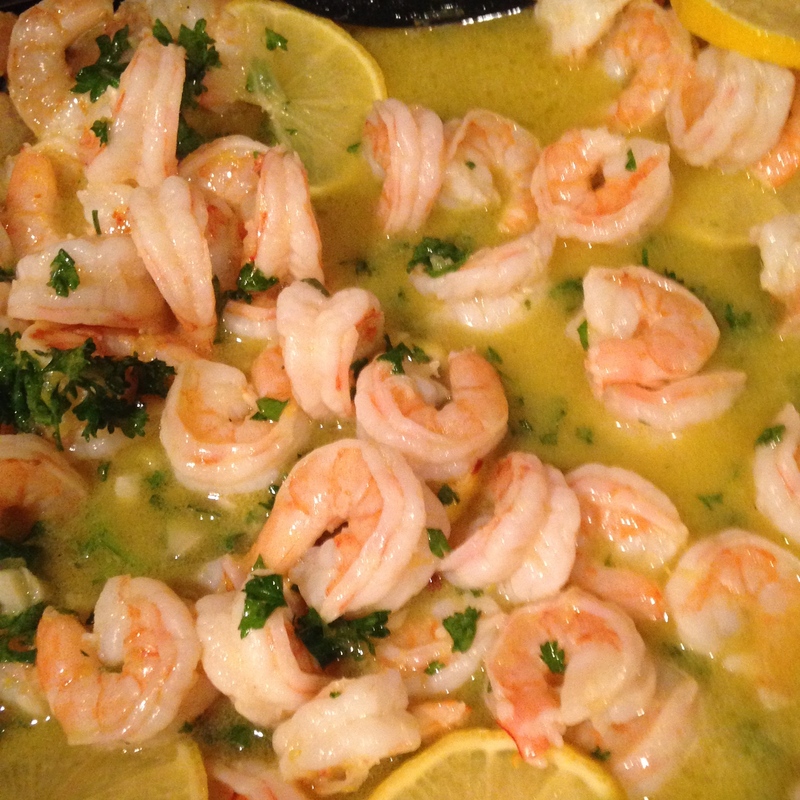 Categories: Ina Garten, Main Dish - Pasta, Main Dish - Seafood | Tags: Ina Garten recipe, Shrimp, Shrimp Scampi | Permalink. 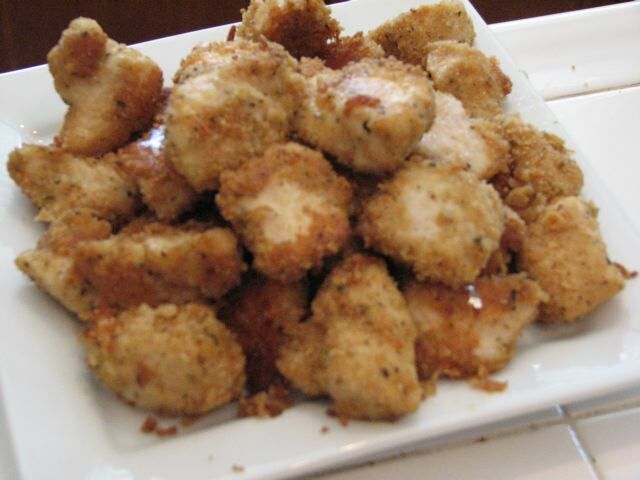 These wonderful little Parmesan and cracker crumb coated bites of chicken never last long around my house! My husband says they are much better than anything McDonald’s serves up (yeah, of course they are made from scratch and not “pre-chewed” patties of chicken). I was cleaning out my pantry and fridge today to make lunch. I served them with couscous. Cover two baking sheets with foil. Cut chicken into 1 inch pieces. Dip chicken pieces into melted butter and add a few pieces at a time to the bag of crackers. Close the zip lock and have a child shake the bag to coat the chicken. Place the chicken pieces about 1/2 inch apart from each other on the baking sheets. Repeat process until all chicken pieces are coated and on the baking sheets. Bake uncovered until golden brown 20-25 minutes. Yields about 9 dozen pieces. Categories: Family Cooks, Favorite, Kid's can cook!, Main Dish - Chicken | Tags: chicken nuggets, Food, kid food, Recipe | Permalink. This is one of my favorite dips. I found the recipe in a Schwan’s Catalog. Although, I don’t use Schwan’s products in this, it turns out great! This dip is particularly good with slices of a fresh crusty baguette. Directions: Preheat oven to 400F. Saute and crumble the Italian Sausage until cooked and no longer pink. Add chilies and bell peppers, cooking 2-3 minutes. Remove from heat and stir in remaining ingredients, except green onions (and bread of course). Bake 15-20 minutes. Sprinkle with green onions or chives and serve with sliced bread or tortilla chips. Categories: Appetizers, Dips, Products, Snack Food | Tags: Dip, Dip for Bread, Sausage Cheese Dip, Sausage Dip | Permalink. 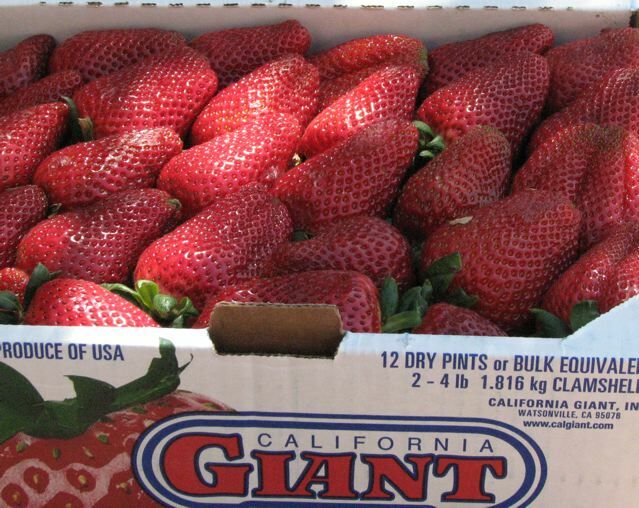 One of the benefits of living in Southern California is the moderate climate and great fruits and vegetables, in particular avocados, artichokes and my personal favorite (and that of my kids): Giant sweet strawberries! My kids favorite use of them is Chocolate Covered Strawberries. My favorite is freezer jam. 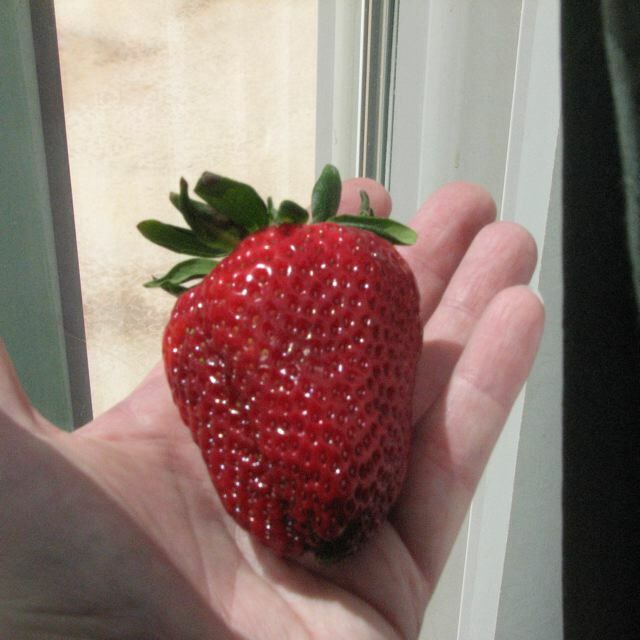 Other classic uses of course is: Strawberry Shortcake. I love to pair them with Spinach Salads with a Poppy Seed Dressing as well. My daughter, Debra turned 11 today. I am making her favorite soup: Avgolemono Soup (already posted on this blog) and I made a cake (from a cake mix) and decorated it myself. I am not the best baker — I like to stick to cooking, but she requested it, so I made her one. I think she was pretty happy with the result. One of Debra’s things to do is to walk into a room and say “Hi” even though she saw you 5 minutes ago (and probably said “Hi” then too). 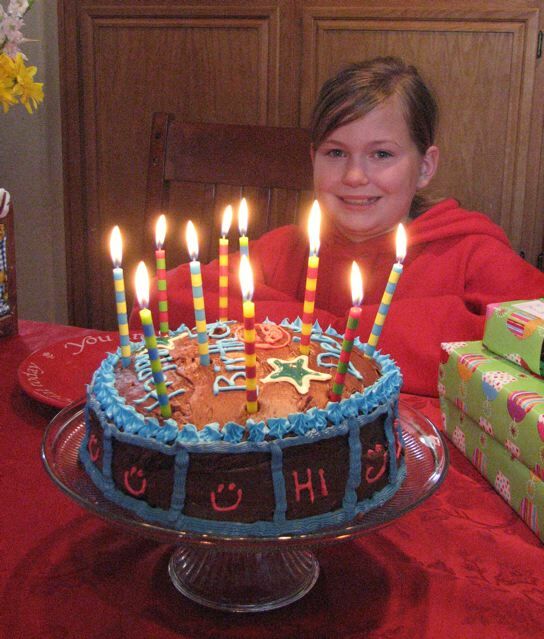 It has become a joke in our family, so I wrote “Hi” on her cake as well to personalize it. So Happy Birthday Debra! Enjoy your special day! Categories: Dessert - Cakes | Permalink.